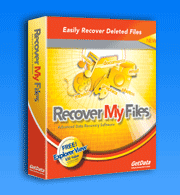 Recover My Files data recovery software download. Note: The type of license key purchased (e.g. Standard or Professional) determines what features will be available once the program is activated. There is not a separate download link for different versions. Purchase a product activation key to save the files. You must save files to a drive other than the one on which they are being recovered. For assistance in selecting the search best suited to recover your deleted files, please refer to our data recovery quick start guide. "Bring data back from the dead. Recover My Files data recovery software has a no-nonsense approach and stellar results."